There’s some very welcome news out that Greenwich council has allocated £400k to be spent improving the public realm (pavements etc) across the borough. Details can be found by clicking here and looking at section 5. This is a part of the Highways Improvement & Local Labour (HILL) project. It begun last year and offers apprentices from GLaaB work experience, with 100 roads targeted for improvements. Last year mainly focused on new tarmac but promisingly this year offers wider scope and better streets. 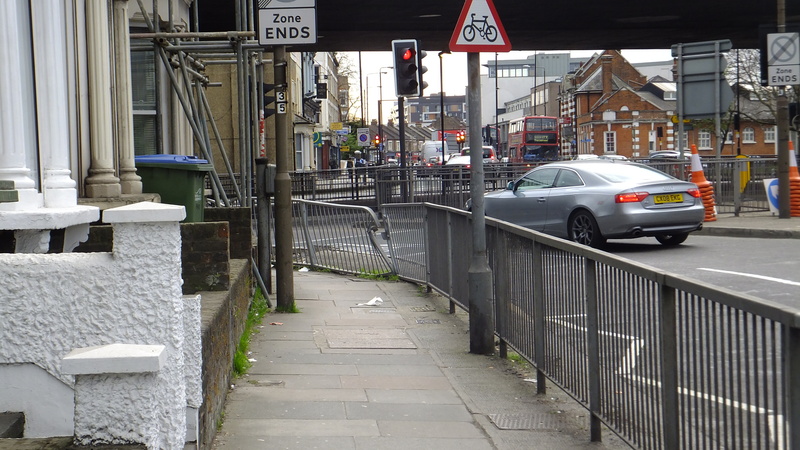 One of those mentioned is the utterly rubbish area around the Blackwall approach/Woolwich Road flyover. The photo at the top of this post shows one approach. It’s a miserable place, not only below the flyover, but on all approaches. Local group EGRA recently compiled a report on the very poor state of East Greenwich for pedestrians and so seeing this is very welcome. The area heading to the Peninsula has very poor, dated street design, as does the other side outside East Greenwich library. Some removal of the excessive amounts of ugly and dangerous guardrail would open up the area and be safer for cyclists. 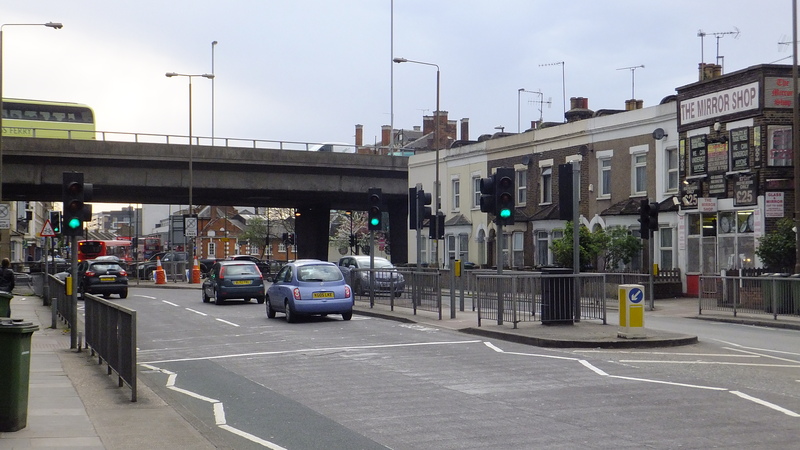 Remaining stretches can be painted cheaply or see better-quality replacement (the stretches at Eltham are to be surplus to requirements soon due to its £4.5m street improvement scheme) and attractive lighting installed. £400k isn’t a great deal of money but it’s enough to create real, immediate improvements. After all, many of these improvements are relatively simple, and can be made cheaply and quickly. Removing street clutter and excess guardrails, and a lick of paint on what’s left, is a low cost endeavour that will bring numerous benefits. 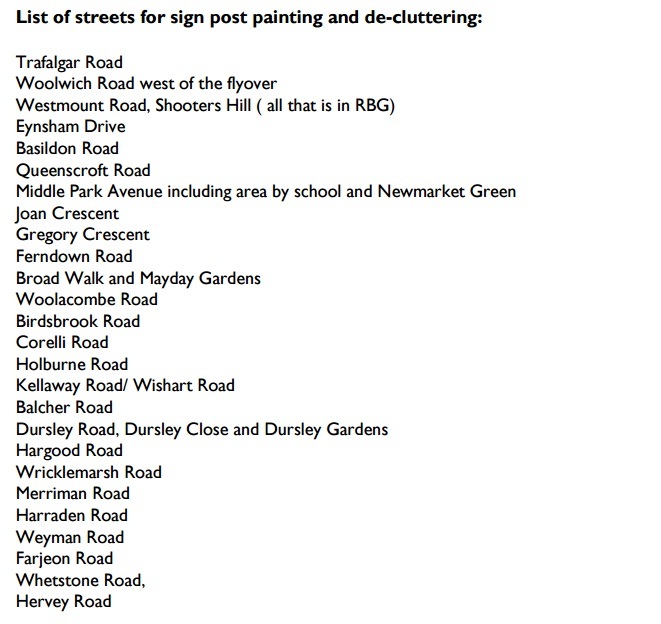 Below is a cut and paste of other streets included: Well done to the council for this. I’ve criticised them often, along with the Highways Department, for the poor state of so much public realm and streets across the borough. It dissuades walking and cycling, erodes civic pride and encourages behaviour such as fly-tipping. Ugly streets are not places businesses thrive or areas people want to visit and spend time. For so long the neglect of streets and public spaces seemed to be disregarded as a concern and a lack of appreciation was evident in the myriad negative effects. I see welcome signs of change recently. Not enough yet, as public realm still see scant mention in council documents, committees and meetings. Other councils in London often have “improved public realm” prominently listed in the functions of various committees and Councillors roles, in Section 106 and Community Infrastructure Levy plans, in funding applications to various bodies like the GLA’s LIP funds and quite a bit more. Greenwich council isn’t there yet, as better, more attractive and user-friendly public space is often noticeable by its absence but signs of improvement are appearing. Hopefully this keeps up! I’d love to know if GMV are revealing to the purchasers of these Peartree Way flats (many of whom I suspect are overseas and buying off plan) that they will be living next to a smelly and noisy waste recycling centre!